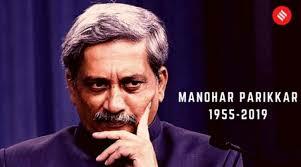 Goa Chief Minister and former Defence Minister Manohar Parrikar passed away at 63. Manohar Parrikar Death: The Goa CM had been ailing for the last one year and has undergone treatment in the US as well as at AIIMS, Delhi, and a private hospital in Mumbai. Goa Chief Minister and former Defence Minister Manohar Parrikar (63) passed away on Sunday after a prolonged battle with pancreatic cancer. Parrikar had been ailing for the last one year and has undergone treatment in the US as well as at AIIMS, Delhi, and a private hospital in Mumbai. A condolence meeting for him will be held in the Union Cabinet at 11 am on Monday. Parrikar attended the Budget session of Goa Assembly on January 29 and presented the state budget the next day. On the last day of the session on January 31, he was taken for treatment to AIIMS in Delhi and he returned to Goa on February 5. Saying that Parrikar was the “builder of modern Goa”, Prime Minister Narendra Modi said his pro-people policies ensured the state scaled remarkable heights of progress. “Manohar Parrikar was the builder of modern Goa. Thanks to his affable personality and accessible nature, he remained the preferred leader of the state for years. His pro-people policies ensured Goa scales remarkable heights of progress,” Modi tweeted. Paying tribute to ‘one of Goa’s favourite sons’, Congress chief Rahul Gandhi said Parrikar was respected and admired across party lines. “I am deeply saddened by the news of the passing of Goa CM, Shri Manohar Parrikar Ji, who bravely battled a debilitating illness for over a year. Respected and admired across party lines, he was one of Goa’s favourite sons,” he said. Born on December 13, 1955, in Goa’s Mapusa, Parrikar completed his schooling from Loyola High School and graduated from IIT-Bombay in metallurgical engineering in 1978. After getting married to Medha Parrikar, the couple was blessed with two sons. However, in 2000, his wife died of cancer. His first brush with politics happened in the year 1994 when Parrikar was first elected to the Goa state assembly at just 39. There were only four other BJP members in the state assembly. He soon climbed the organisational ladder and rose from an RSS pracharak to become Leader of the Opposition in the Goa Assembly in 1999 (from June to November). Manohar Parrikar played a key role in making the BJP a force to reckon with in Goa, which remained for long a Congress bastion. He went on to become the Goa CM on October 24, 2000 and continued in the post till February 27, 2002. However, he was re-elected as CM on June 5, 2002. Later, he lost his chair to another set of defections and faced a drubbing in the hands of Congress in 2007. However, Parrikar made a stunning comeback in March 2012, with BJP and allies winning 24 constituencies. He was the Goa CM until November 8, 2014, when he was given the charge of the Defence Ministry. He was succeeded by Laxmikant Parsekar as the CM. Known for working behind the scenes and leading a simple lifestyle, Parrikar is credited for developing quality infrastructure in the state in a short time. Among his major achievements was bringing the IFFI (International Film Festival of India) to Goa. Parrikar resigned as Defence Minister in 2017 for his fourth stint as Goa CM after BJP, which failed to cross the half-way mark in the Goa assembly polls, enlisted the support of the Goa Forward Party (GFP), Maharastrawadi Gomantak Party (MGP) and two Independents, to reach the magic figure of 21 in the 40-member house. As defence minister, Parrikar had pressed for modernisation of the armed forces and under him, India carried out surgical strikes in Pakistan-occupied Kashmir and Myanmar. Besides putting in place a new Defence Procurement Policy (DPP), Parrikar is also credited for implementing the OROP scheme in 2015.